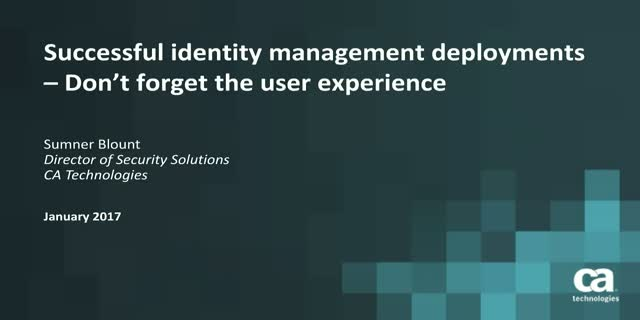 A critical element to the success of an identity management deployment is the user experience, but it’s often overlooked, or not given high enough priority. An identity management deployment without a seamless, convenient user experience could be the make or break point for success. The promise of digital identity is to remove silos; minimize redundancies; facilitate better collaboration; and shape a foundation for regulatory compliance. In this session, Ora Niknamfard, Product Marketing Manager Security at CA Technologies will share industry best practices to help ensure credentials are, in fact, interoperable. Plus, you’ll have a unique opportunity to explore the architectural measures that can manage identity assurance levels and identity verification for both logical and physical access. Implementing a digital identity strategy can be complicated. Let CA help. Adopting privileged access management typically means forcing users to use named accounts instead of root and administrator accounts. As a result, the volume of privileged "named user" accounts in the enterprise is increasing. Fortunately, with effective role management and certification review, organizations can streamline and reduce excessive access. Join Naresh Persaud, Senior Director of Security at CA Technologies as he explains the challenge of privileged user governance, explores solutions, and presents a demo on how to manage privileged "named users." For businesses and government organizations to succeed, development and security teams must quickly build, test, and deploy secure apps and features. The challenge presented by this DevOps process? Typically, there are only a few security teams to support many development teams. We’ll also cover how to apply DevOps techniques to your infrastructure, allowing security teams to better prepare for releases, minimize downtime, and avoid costly upgrades. Today’s consumers do not want to wait on the phone for customer service. Today’s consumers do not want to fill out lengthy online forms to access information or resources. In short, today’s consumers’ time is valuable and not unlimited. As a result, every company is redefining its online digital experience to maximize customer engagement, enhance brand affinity, and increase consumer wallet share. This is your opportunity to learn how harnessing digital consumer identity can foster an effective consumer engagement strategy. Join Naresh Persaud, Senior Director of Security at CA Technologies as he shares case studies from multiple industries that are exploiting the power of digital consumer identity to build trust and make customer interaction frictionless. Today’s CA Single Sign-On (SSO) solution is not the CA SiteMinder of yesterday. Yes, SSO continues to offer seamless access management services using traditional agents, but it also offers a new range of agentless approaches. So now, you can use single sign-on and access management for applications of all shapes and sizes. Insider Threats are real. Be ready. Join CA hosts - Rob Marti, Privileged Access Management Director and Alexandra Beswerchij, Product Marketing Manager - to review the research and discuss how a layered and comprehensive Enterprise IAM approach enhances PAM to provides an effective countermeasure to both insider attacks and external actors. Exploit key security tactics and strategies. Today, it’s estimated that 80% of companies are not prepared to comply with GDPR. The most challenging use cases are managing portability, conducting certification campaigns, and overseeing data access approval. Are you ready? What’s more, we’ll demo a dashboard for the Data Protection Officer to use for compliance reporting . Whether you are new to cybersecurity or an experienced professional, threat intelligence should be on your “need to know” security agenda. May 25, 2018. It’s a date that is approaching quickly. It’s also the deadline for GDPR compliance. For companies that fail to comply, the cost can be high - as much as 4% of annual turnover. Note: There is a misconception is that the regulation affects only companies in the European Union. In fact, it applies to any company that has dealings or plans to have dealings with citizens that reside in the EU. Take the lead and get ready to initiate GDPR. Join Cullen Lemley, Cybersecurity Consultant at CA Technologies, for an overview of the impending regulations. Learn the important security facets of GDPR, the challenges for Privileged Access Management, and how businesses around the globe are preparing for the deadline. Today, consumers are using millions of devices to buy whatever, whenever, and wherever. However, this rapid evolution of e- and m-commerce has created a target for fraudsters to falsify identities and defraud merchants, consumers, and banks out of millions. So, how can you stay ahead of sophisticated cybercriminals, reducing CNP Fraud Losses by 25% or False Positives by 35%. Your biggest security risk may be inside your organization. Today’s most damaging threats don’t originate from criminal outsiders or malware but from insiders - both malicious and careless. So, are there preventative options? All registrants will receive a full copy of the new 2018 Insider Threats Report. • How are potential risks being monitored and secured? • How are users and devices being managed? • How are directory services being configured? Learn to address these challenges, while shaping a more secure and cost-effective infrastructure. Join CA Technologies gurus Clayton Donley, SVP, Software Engineering, Security and Rob Lindberg, Sr Principal Product Manager, CA Directory to explore alternatives and recommendations. You'll also be able to compare performance results of leading next-gen directory services, tested and compiled by an independent, third-party. It’s a dilemma. Today, security must be built into mobile applications to fight rampant online fraud, but many App Developers don't have the necessary skill set … nor the time required to become proficient coders. What is the answer? Let your developers focus on mobile applications requirements, while your business delivers a trusted user experience. Are you using or plan on using managed security services for privileged access or identity management? The market for managed security service is undergoing tremendous growth – it’s set to double within the next two years. Join us to learn how one MSP uses Privileged Access Management and Identity Management to streamline internal security controls and help customers reduce risk. We'll discuss use cases that managed security companies are addressing and provide insight on how best of breed companies are adapting. Recently, there have been several payment industry initiatives designed to make electronic payments safer. Consequently, financial entities like merchants, PSPs, and consumers will soon face many changes. Although the initiatives’ premise − to eliminate vulnerabilities in the payments cycle − is welcome; businesses must now prepare to comply. Are you ready? 3-D Secure 2.0’s impact on the financial industry will be one of the most significant in recent years. Built around the increasing popularity of mobile commerce, 3-D Secure 2.0 is predicated on risk-based authentication, leveraging data points for accurate verification, while optimizing the consumer experience. The application economy is altering the way we live, work, and interact. As a result, organizations are transforming the way they provide services to customers, employees, and partners. But no matter how these services are accessed, a fundamental concern remains: How does an organization protect sensitive data, while still allowing a frictionless and enjoyable user experience?Join David Duncan, VP, Security of CA Technologies and (ISC)2 on Thursday, January 11, 2018 at 1:00PM Eastern for examination of the cybersecurity risks that can result from application development and what it takes to future-proof business trust. Access to and within DevOps environments have proliferated over the past few years, with both users and scripts (with embedded credentials). This privileged identity sprawl poses significant risks that need to be addressed.Join CA Technologies and (ISC)2 on December 7, 2017 at 1:00PM Eastern. In this session, we'll look at the technology and approach that CA takes to secure such environments. A new technology has emerged called Attack Path Mapping (APM). APM lets you evaluate the probability of the hacker kill chain and quantify the risks, significantly reducing risks through more effective controls. Join Ed Parsons, Associate Director at MWR InfoSecurity and Naresh Persaud, Sr. Director of Security at CA Technologies as they share how APM can help companies think like a hacker, leveraging insight to resolve vulnerabilities. What’s more, find out how Scotia Gas Network and National Center for Cyber Security are successfully employing Attack Path Mapping … today. This channel covers Layer7 Privileged Access Management, Layer7 Identity & Access Management, and Layer7 Payment Security. We will focus on topics including identity, privileged users, payment security, access management and other top cybersecurity trends in the industry.